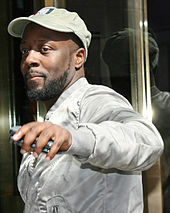 ^ "Wyclef Jean steps toward Haitian presidential race". Reuters. July 30, 2010. ^ "The Fugees: Reunited and Not Very Good". www.villagevoice.com. Retrieved January 25, 2018. ^ "Melky Sedeck Discography". Discogs. Retrieved February 13, 2012. ^ "Wyclef Revisits Hip-Hop Roots On 'Toussaint: St. Jean' EP". Billboard. September 14, 2009. Retrieved February 13, 2012. ^ Dreisinger, Baz. "Ready or Not: 'Purpose: An Immigrant's Story,' by Wyclef Jean". The New York Times. The New York Times Company. Retrieved April 30, 2016. ^ "Wyclef Jean Announces Caribbean-Themed 'J'ouvert' EP". Rolling Stone. Retrieved June 18, 2017. ^ "Wyclef Jean Announces Release Date for 'J'ouvert' EP". Spin. August 8, 2016. Retrieved June 18, 2017. ^ "If I Was President 2016 - Single by Wyclef Jean on Apple Music". iTunes. Retrieved June 18, 2017. ^ "I Swear (feat. Young Thug) - Single by Wyclef Jean on Apple Music". iTunes. Retrieved June 18, 2017. ^ "JEFFERY by Young Thug on Apple Music". iTunes. Retrieved June 18, 2017. 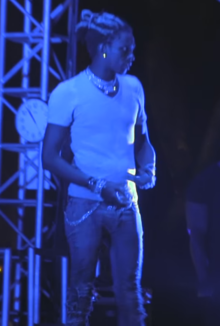 ^ "Wyclef Jean Talks Young Thug, Trap Music And The Joy Of Carnival". NPR.org. Retrieved June 18, 2017. ^ "J'ouvert (Deluxe Edition) by Wyclef Jean on Apple Music". iTunes. Retrieved June 18, 2017. ^ "Top 200 Albums". Billboard. Retrieved June 18, 2017. ^ "Billboard Canadian Albums: Top Albums Chart". Billboard. Retrieved June 18, 2017. ^ "WyclefVEVO". YouTube. Retrieved June 18, 2017. ^ "Instagram post by Wyclef Jean • Jun 9, 2017 at 6:49pm UTC". Instagram. Retrieved June 18, 2017. ^ Union, Wonderful. "Wyclef". Wyclef. Retrieved January 7, 2018. 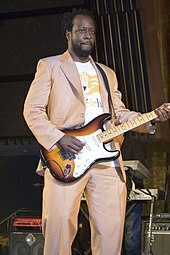 ^ "Wyclef Jean Haiti Earthquake Appeal". 3threat Media. January 13, 2010. Retrieved January 18, 2010. ^ Matthew Perpetua (September 15, 2011). "Wyclef Jean: I'm A Big Fan of Sarah Palin". Rolling Stone. Retrieved December 13, 2012. ^ "MOVIE REVIEW: Shottas". Slant Magazine. October 31, 2006. Retrieved November 22, 2011. ^ "MTV Act Blog". MTV. February 9, 2012. Retrieved February 13, 2012. ^ "Wyclef Jean – Wyclef And Wife Renew Vows". Contactmusic.com. Retrieved June 26, 2010. ^ ""Carnival III: The Fall and Rise of a Refugee" by Wyclef Jean on iTunes". iTunes. Retrieved June 22, 2017. ^ Press, ed. (July 21, 2011). "Haiti - Social : Wyclef Jean becomes Grand Officer of the National Order of Honor and Merit". Haiti Libre. Retrieved March 14, 2016.